A Source Book of the Early Buddhist Inscriptions of Amarāvatī presents the available corpus of the donative epigraphs, recovered during the last two centuries, from the early Indian Buddhist monastic site of Amarāvatī in the south-eastern Deccan, for systematic analysis and categorization of the inscriptional evidence thereof in historical perspective. 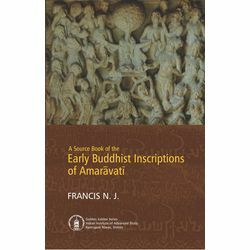 Analysis of the data from the epigraphs in the way it is done in this study helps understand the social, religious, cultural and economic roots of the early Buddhist art of Amarāvatī. Thus the artistic heritage of the early Buddhist Amarāvatī, which had been largely been museumised in India and abroad, can now be historicized and retrieved from the insularity into which the sculptures of Amarāvatī have been put to over the years. It tries to collate inscriptional evidence related to the dynamics of the inter-linkages between art and society, and art and religion in the south-eastern Deccan during the period between 300 BC 300 AD. The book will be of interest to researchers and scholars of Buddhism, ancient Indian history, religion and South Asian studies.